Many braved the frosty evening to attend St. John’s Church, to hear the Ashbourne Town Band, led by Russell Bevan and the Ashbourne Singers, directed by Linda Perry Smith, as they played and sang together to remember the fallen. The band began with the British Legion March, Band of Brothers and the Royal Air Force March Past, before the gentle Adagio by Albinoni, from the film Gallipoli. Then it was the turn of the singers, accompanied on the piano by Steve Duckworth, singing This is the army, Mr. Jones, with an opening solo by Tim Tarling. Gently through Keep you in peace and Barber’s Agnus Dei from the Adagio for strings, to the song made famous last November by the Military Wives and Gareth Malone – Wherever you are, sung by the ladies. 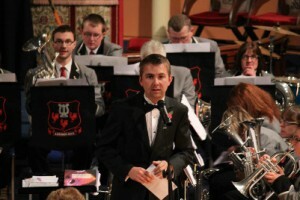 The band and choir combined in a new work, written for Remembrance, called Lest we forget, before refreshments were served. After the interval, the band struck up with Those Magnificent Men, before A nightingale Sang in Berkley Square and Normandy Veterans. The audience were invited to join in with Pack up your troubles, It’s a long way to Tipperary and the White Cliffs of Dover, before they were treated to the gentlemen of the choir singing the Mansions of the Lord. 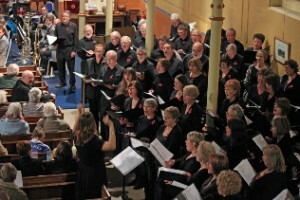 Linda sang a clear soprano solo over the choir’s accompaniment to Amazing Grace, arranged by Steve, to the delight of the audience. At this point, the church was filled with sound, as Michael Halls played the organ, the band played, the singers sang and the audience joined in with Abide with me, before the band ended the music with Elegy from A Downland Suite by John Ireland and Elgar’s Nimrod. Prayers were said, the Act of Homage made and the National Anthem sung by all.